For an instant dose of sunshine, try this smile-bringer! 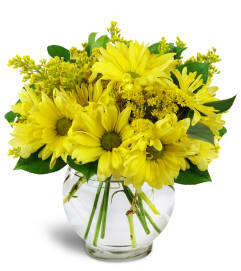 Whether the message is, "You are my sunshine" or, "Things will get brighter," this gorgeous bouquet will make her day! Sunflowers and yellow cymbidium orchid blooms co-exist sweetly with lilies, spray roses and daisies in a simple yellow ceramic cube vase. There’s nothing like it to convey "Happy Birthday," "Get Well Soon," or "I Love You" sentiments with style! 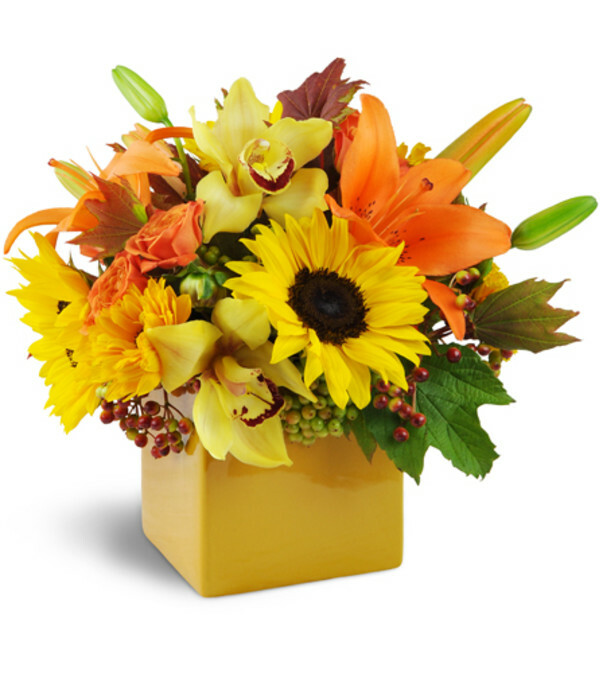 Bright sunflowers, yellow cymbidium orchids, lilies, spray roses, daisies and greens burst from a reusable chic yellow ceramic cube vase. Easy to use online ordering, and very fast turnaround time. My sister loved her flowers and said they were beautiful. I really appreciated the effort to locate her for delivery purposes, even with vague location details. Great experience and I highly recommend Stargazer Premier Florist is Corvallis, OR! I called 10 minutes after the store closed and the owner answered and allowed me to buy an assortment. She had it ready in less than 10 minutes! She was very friendly. Also, the prices here beat any place and have a larger selection. The flowers and arrangement were greatly enjoyed. 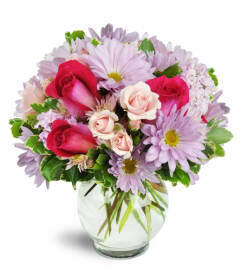 I chose to send the Florist’s Choice which had a variety of color and very fresh flowers. I will definitely use Stargazer in the future. 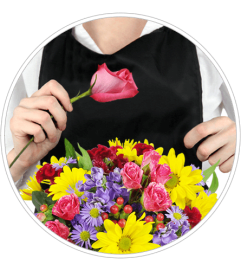 Stargazer Premier Florist is a Lovingly Florist in Corvallis. Buying local matters. Discover how Lovingly supports local florists. Copyrighted images herein are used with permission by Stargazer Premier Florist.